Yesterday’s range trip with Natasha and Jing was a lot of fun. Decent weather for the season, about 50*F and windless, made the shoot more comfortable than expected. We ran quite a bit of ammunition ranging including 5.45×39, 5.56×45, 6.5Grendel, 6.8SPC, 7.62×39 and .458SOCOM through a variety of guns, all using the same magazine designed by Jing. This magazine means I no longer have to remember multiple types of AR magazines when bringing both 300Blackout and 338Spectre at the range. Or .223 and 7.62×39. Production magazines (shown in the video) have a black finish. Back to the Tavor: it works and it works well. This was my first shoot using the new Geissele trigger, the drop-in upgrade that takes shooting the rifle from being work to being fun. I pulled the EOTech sight to use on another rifle, but the irons were zeroed from the factory and good enough to hit the small steel targets at 50 and 60 yards, and a rock of about the same size at 75 from standing, rapid fire. Unlike most rifle peep sights, Tavor uses very minimal rear which allows shooting with both eyes open, just like with a red dot. Illuminated front sight snaps into focus very well, and the defocused target remains visible in the peripheral vision. 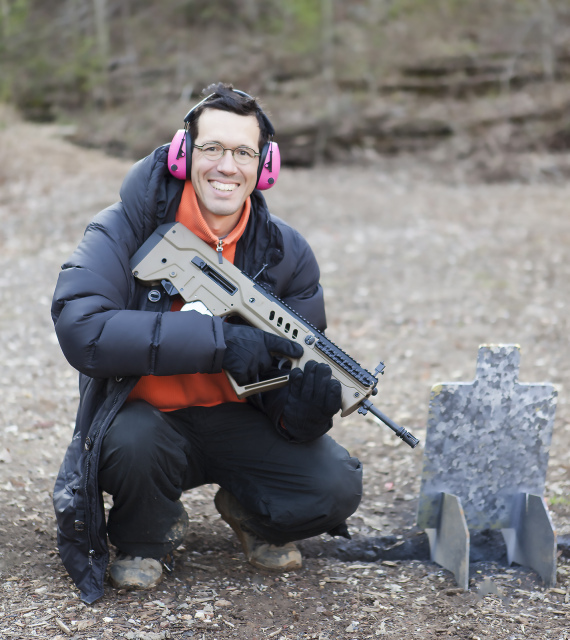 This entry was posted in rifle, Uncategorized, weapon and tagged 223, bullpup. Bookmark the permalink. 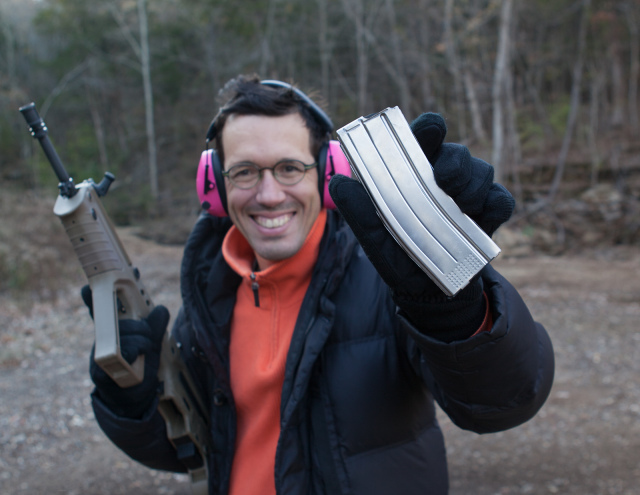 Once those magazines hit the market, I am going to have to stock up… not because I have AR-pattern firearms in a variety of calibers, but rather because, after talking to the gentleman behind them, they seem like a wonderfully useful thing to have around if I ever do :).